The Journalists Association of Korea has embarked on a campaign to raise funds to help thousands of North Korean train blast victims. In an announcement released April 29, 2004, the JAK, the largest association of working journalists in Korea, urged journalists at home and abroad to join it in its noble drive. "What is more tragic about the accident is the fact that about 80 schoolchildren were among the dead," the statement said. "Given North Korea's dire economic situation and inadequate medical facilities and supplies, the death toll is expected to rise as time goes by." North Korea's unexpected, comparatively quick acknowledgement of the blast and prompt appeal for international aid manifest the seriousness of the accident, it said. 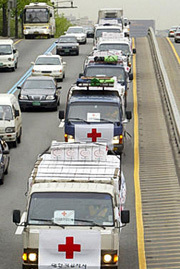 North Korea's secretive state media only acknowledged the tragic accident April 24, two days after the disaster, but has since taken the unusual step of publicizing the international aid efforts in newspapers and on television. North Korea officially acknowledged the scale of the tragedy for the first time April 26. "To assist with the humanitarian efforts, we, the Journalists Association of Korea, the largest association of working journalists in Korea, are embarking on a fund-raising campaign starting today to help the North Korean victims," the statement said. The JAK also asked all journalists at home and abroad to join it in this noble drive, which it believes will help advance the date in which the two Koreas are reunified. "We also ask foreign journalists to pay special interest to the humanitarian work related to the accident," it said. The JAK sent the announcement through e-mail to the International Federation of Journalists, the world's governing body of journalists associations, and other journalism-related international organizations. It also sent the message to all the member countries of the East Asia Journalists Forum. The JAK launched the forum last year to help foster solidarity and unity among journalists in East Asia, drawing some 40 representatives from 14 countries. Mr. Kang Seok-Jae serves as a senior writer for The Seoul Times. He teaches as a professor at his alma mater, the HUFS Graduate School of Interpretation & Translation. 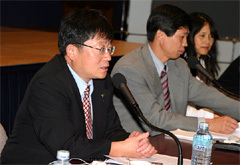 Mr. Kang also serves as chairman of the International Affairs Committee of the Journalists Association of Korea.